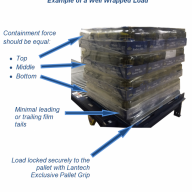 The pictures below show the original wrap pattern the customer was using to secure the load as well as the load after Technical Packaging Systems conducted its containment force analysis. 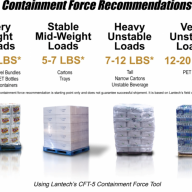 It was originally determined that the top and bottom portions of the load were unstable. 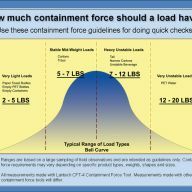 The corner protectors and banding pattern in the original load offer very little support in this application. 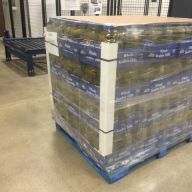 Technical Packaging Systems was able to analyze the desired pallet load and conduct its containment force analysis to maximize the load containment force. Once removing the corner protectors and banding, we were able to get an above average containment profile by increasing the film gauge. 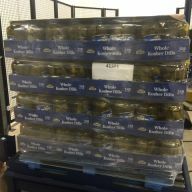 This result allows for a faster packaging process while also decreasing the cost to the user. 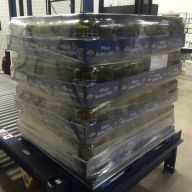 The implementation of this plan significantly reduced the risk of damage to product in shipment by eliminating the variation in containment forces. 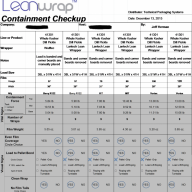 It also improved overall packaging / unitization quality with standards and a process for monitoring adherence to the standards. 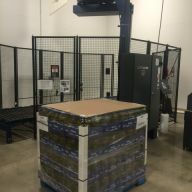 Technical Packaging Systems reduced the labor and wrap cycle time by eliminating bands and corner boards, while still achieving higher containment profile values using a thicker gauge film.